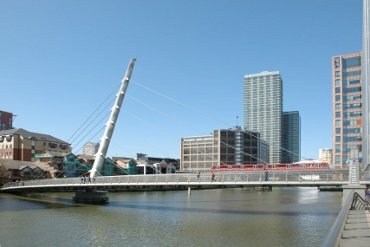 The original docks here, around which the new development grew, were started in 1800 and building for the new Docklands development project began in 1988. 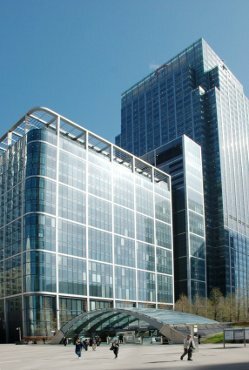 One part of this new development is known as Canary Wharf and that name is often applied to the whole area. The name stems from the fact that bananas from the Canary Islands used to be unloaded here when the docks were still working. There are now some large financial institutions here together with other offices, shops, restaurants and housing. This view is from Greenwich Park. 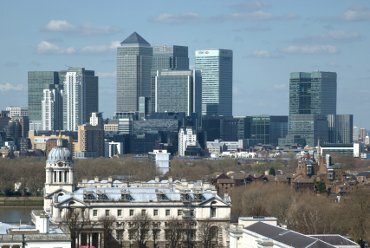 This view of Canada Square shows the low rounded top of the Canary Wharf undergound station on the Jubilee Line. The Canary Wharf Station on the Docklands Light Railway is a little further away. Although this area is ultra-modern it has a pleasant atmosphere. 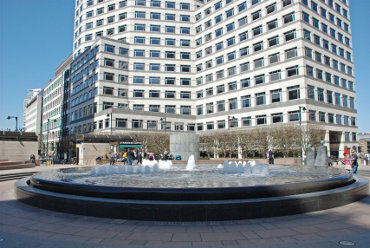 Cabot Square, named after the explorer John Cabot, on the west side of Docklands. Access to the underground shopping centre is behind the camera and there is, as you can see, a fountain together with several other works of art. It is a short walk to West India Quay from here. The footbridge over South Dock at Heron Quays with a DLR train just leaving Heron Quays Station from the right. The lower of the two buildings in the centre is the Britannia International Hotel. Crossing the bridge takes you over the dock to South Quay and eastward towards the River Thames. 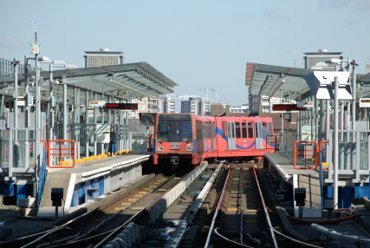 The Docklands Light Railway was built as part of the new development and connects with other parts of London's transport system. The stations on this line are not very far apart. This photograph demonstrates that fact when you realise that it was taken from the end of the platform in Canary Wharf Station and shows the train leaving the next station along.